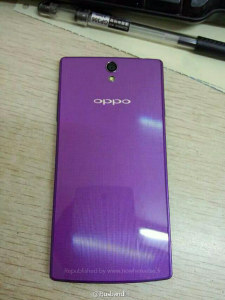 Oppo's teasers revealed that the upcoming Find 7 phablet will come in two versions, but so far we didn’t know the exact differences. 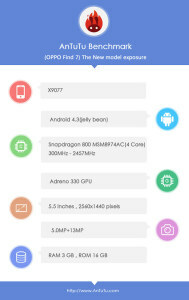 AnTuTu's team comes through once again, digging up both versions in their database. The X9007 differs from the X9077 in the screen resolution – the lower model has a 1080p screen, while the other one has a QHD screen (2,560 x 1,600). Both have the same screen diagonal, 5.5", even though the benchmark didn’t detect the screen size on the 1080p model. 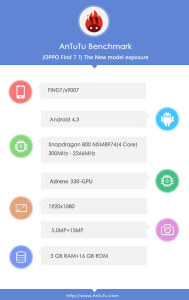 Other than that both Oppo Find 7 devices are identical – they run Android 4.3 Jelly Bean on a Snapdragon 800 chipset with 3GB of RAM, have 16GB of built-in storage, 13MP main camera and a 5MP front-facing one. There's also an new photo of the phablet – in a bright purple color, it looks almost like an Xperia with its flat back and rectangular body. For a view of the front, check out the spy shots of the front panels. The Find 7 will be unveiled on March 19 at an event in Beijing. "Both have the same screen diagonal, 5.5", even though the benchmark didn’t detect the screen size on the 1080p model." So how do you know its screen size is 5.5" if benchmark didn't detect it?